In the mid-1900s Duval Street started to experience reconstruction and construction improvement that gave it a new image and purpose in the city. The majority of Duval Street photos from this time period are associated with the Central Improvement Association that documented the shots for reconstruction planning purposes. In the first picture the desolation and emptiness of this area can be seen with the consecutive line of empty lots on the one side of the street. The street housed sporadic spots of life and action surrounded by empty voids of inactivity. This variability to the consistent structure of Duval Street was the major focus on the improvements of the “sense of place” in this neighborhood. The additional context of this photo was that it was taken from a survey of multiple city officials and members of the Central Improvement Association. This displays the city’s concern for the improvement of this area and the effect that its reconstruction would have on the cities appeal as a whole. 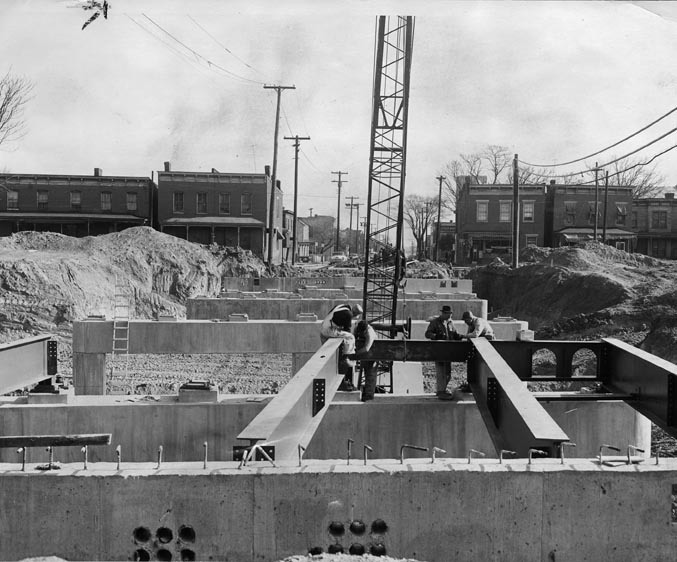 The second photo shows the construction of the Richmond-Petersburg Turnpike, which is a toll road that will cross over Duval Street. The question is why was the Duval Street area picked to have a toll road pass over its residents? After the Civil War and into the early 1900s Duval Street progressed into a predominantly black neighborhood of poor laborers. 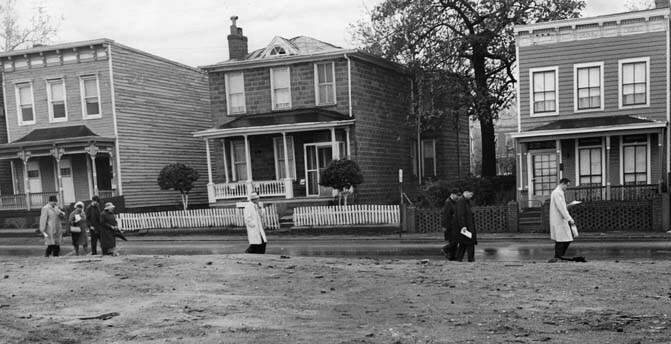 In this low-income area it was common to find empty lots and abandoned houses, which can still be seen in the 1950s photos. Yet, there is a tension between the desolation and need for reconstruction, in the Duval Street area. The fact that the city could build an overpass over this neighborhood shows Duval Street’s lack of importance and respect in the greater context of the city of Richmond. Maybe the city officials in the first picture weren’t surveying the Duval Street area with the purpose of finding ways to improve the neighborhood but for an alterative motive of seeking ways to utilize the desolate impoverished land of the Duval Street Area. For example the Richmond-Petersburg Turnpike toll road detracts from the “sense of place” for Duval Street with loud cars passing overhead, at the same time the toll road will better the efficiency and lifestyle of residents of other parts of the city. Therefore Duval Street in this time period loses its sense of place and deteriorates as a neighborhood of the city, swept aside by the construction endeavors of city officials. 1 Response to Duval Street Loses Steam. The first photo caught my attention particularly because the buildings appear to be slightly crooked. I don’t know if the buildings were in fact tilted in such a way or if the photo appears to skew them a little, but it made me think about the ways we can take photos to get a point across, just like when we write an essay for an argument. I bet that if these homes had been photographed from another angle, they might have appeared more sturdy. But if whoever took this photograph wanted to illustrate the deteriorating condition of the buildings, as well as their lack of appeal, he or she did a good job with this photo.